The screenplay was written for the The Last Man by Carl Meyer and it is the most famous example of a Kammerspielfilm or “chamber-drama” film. Throughout the film there are next to no intertitles, as Murnau was not a fan of using them. He rarely used intertitles in his other films, most notably Sunrise: A Song of Two Humans. In The Last Laugh, Emil Jannings, a notable silent film actor, plays the main character. The film follows the story of an unnamed hotel doorman at a famous hotel called the Atlantic. He is extremely well respected by his family and neighbors for his ‘prestigious’ position. The owner sees him sitting down to relax his muscles after lifting luggage and concludes that the doorman is getting too old for the job. He thus demotes the doorman to the position of washroom attendant. He holds the towels for wealthy men at the hotel who smoke big cigars. The unnamed man goes to great lengths to hide his shameful new position from his family and friends, but soon his wife discovers him when she visits to bring lunch and his family disowns him. The man finds himself in horrible grief as he wanders back to the washroom at the Atlantic to fall asleep. The only person who is kind to the man is the night watchman who covers him with a coat to keep him warm. Thus a sham comedic ending occurs wherein a newspaper reveals that the man inherited a fortune from a Mexican millionaire named U.G. Monen, a patron who died as he cared for him in the hotel washroom. The man returns to the hotel where he eats a large meal along with the night watchman as they celebrate their riches and handsomely tip all of the doormen on their way out to a carriage with another man begging for money. The film was the first that Murnau completed with UFA Studios and it was noted for its innovative use of camera movements. In one scene a camera is strapped to a man’s chest as he rode a bicycle, in another a camera is sent down a wire from a window to the street below. The first ever “dolly” was used for the film during shots through the hotel as Emil Jannings moved through it. It was entirely filmed at UFA Studios using large elaborate sets. Murnau famously noted that the film was utterly absurd because “everyone knows that a washroom attendant makes more than a doorman.” At the time, a young Alfred Hitchock was working at UFA Studios in Germany. F.W. 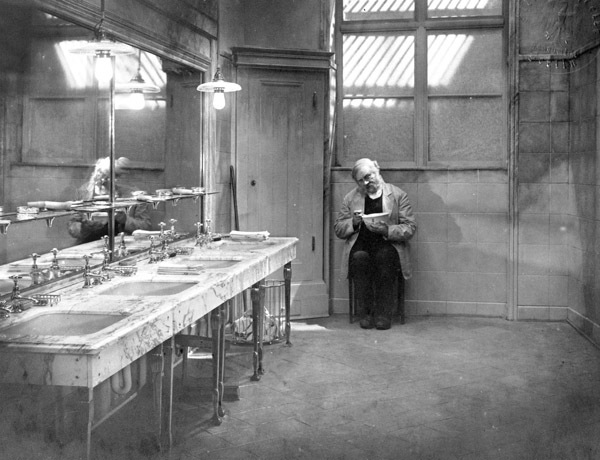 Murnau and Carl Meyer originally wanted the film to end with the death of the doorman in the bathroom, however executives at UFA pressured them to come up with a more marketable ending. Thus they crafted a clearly cynical ending and they wanted the film’s title changed from “The Last Man” to “The Last Laughter”. 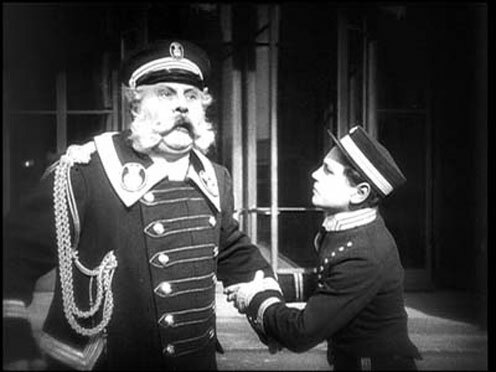 Emil Jannings starred in other projects of F.W. Murnau’s including as Mephistopheles in Faust and a number of Nazi propaganda films until his death in 1950 of liver cancer. When the Allies invaded Germany, Jannings reportedly carried his Oscar with him to justify his allegiance to the Allies. He won the first ever Oscar for Best Actor in 1929 for his role in The Way of the Flesh and Josef von Sternberg’s The Last Command. His Hollywood career was short-lived after the advent of talkies because his thick German accent didn’t sit well with the general public in the U.S. and thus he returned to Europe. Much like Murnau’s Sunrise, The Last Laugh takes an astonishingly simple story and transforms it into a classic. It is a wonderfully sardonic film composed of wildly innovative cinematic techniques and brilliant acting from Emil Jannings. Truly a remarkable film worth seeing.